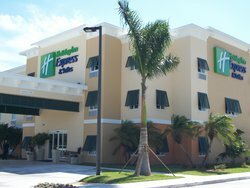 When you stay with us at the Holiday Inn Express Marathon in the Florida Keys, enjoy access to all the amenities you’ll need for a relaxing and stress-free stay. During the day, explore our island home of Marathon and partake in great outdoor water activities. Discover ocean wildlife, go on a fishing excursion and more! 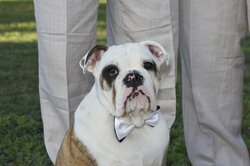 No need to leave your best friend at home - We are Pet Friendly! At the Holiday Inn Express Marathon, we understand the importance of bringing the entire family along on your next family vacation. For $75 per pet for the duration of your stay, bring your four legged friends along and enjoy a resort-style vacation with us in the Florida Keys! 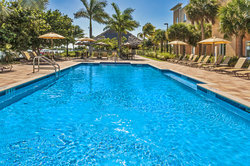 Escape the Florida heat by taking a dip in our onsite heated pool on a hot summer’s day. If swimming is not for you, sit by the pool and enjoy a drink or cocktail as you relax in the sun. You won’t have to miss your workout when you stay at the Holiday Inn Express Marathon. 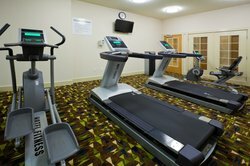 Our hotel features a 24 hour fitness center with all the equipment you need to stay in shape and burn off all of those vacation calories. 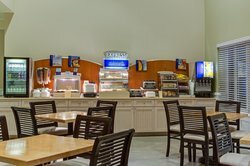 No matter your reason for travel, stay connected and keep up to date with work when you stay at the Holiday Inn Express Marathon in the Florida Keys. 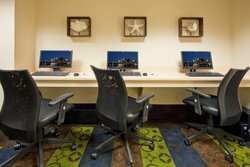 Our property has a 24 hour business center with desktop computers, printing, photocopying, and faxing facilities. If you don’t want to go down to the business center, get work done right from your room by utilizing your work desk area and free Wi-Fi throughout the hotel. Sign up for IHG Rewards and earn 1,000 points plus 10 points for every dollar you spend.